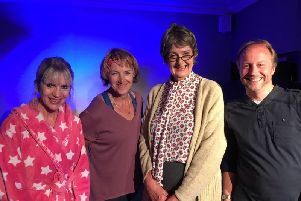 Players spokesman Steven Knopf said: “This is the third time Lancing Repertory Players have produced this very popular play. The first time was in 1984. The second time was in 2011 when it was directed by the late David Ryall. “In 1894 Oscar Wilde stayed in Worthing and wrote his play Lady Lancing. He probably didn’t envisage 125 years later, in 2019, the play would be being rehearsed for a production in Lancing, and that he himself would once again pay a visit to Worthing. “Billed as a trivial play for serious people, Lady Lancing was the working title for Wilde’s most renowned comedy, The Importance of Being Earnest. “Wilde himself has made a surprise return to Worthing in the shape of a mysterious and artistic piece of graffiti that has appeared this month on the side of the Corner House pub in Worthing High Street. “The Importance of Being Earnest is the story of two bachelors, John Worthing and Algernon Moncrieff, who both create alter egos named Ernest to escape their own tiresome lives. They attempt to win the hearts of two women who, conveniently, claim to only love men called Earnest. The pair struggle to keep up with their own stories and become tangled in a tale of deception, disguise and misadventure. Tickets cost £9.50 and can be reserved by visiting http://www.lancingrep.co.uk/boxoffice or by ringing the box office on 07933 958 823. Booking fee with online bookings.